It’s no secret that the internet has changed the way we shop. And for the most part, retail has done a great job of adapting to the online space. But despite adopting online stores and advertising, many retailers overlook one key component: the modern customer journey. In this post, we’ll discuss way the ROPO effect, which is reflective of a larger seismic shift in how consumers get their information about products, then carry that information into their buying decisions. Curious? Read on to learn more about how your online presence impacts your offline sales. What is the “ROPO” effect? “ROPO” stands for “Research Online, Purchase Offline.” It’s a consumer phenomenon where shoppers will find all of the information they need about a product online, but will make the final purchase in-store. Traditionally, there hasn’t been any “online” part of the consumer journey. If you wanted to buy something, you needed to get in touch with a salesperson to discuss the features and benefits of the products, as well as the market-ready options. You’d likely have to go to a store to find this information, or book an appointment for a sales person to come to your house. You’d also probably search out some reviews, of course, but they might be harder to find. Now all a consumer has to do before buying a product is search “[product name] review” on Google or YouTube and tap “enter.” They’ll instantly go to a new page filled with reviews and comparisons of different products. The majority of these reviews — the ones trusted by viewers — will be from independent channels, not from a company itself. In other words, consumers now do all the research online for themselves. So much so that Bazaarvoice reported 56% of online shoppers read at least one review before making a purchase. Many consumers will then take that research and purchase a product online. But, depending on the product, consumers might still need to go in-store for one reason or another. And this is where the “Purchase Offline” half of the ROPO equation comes into play. If you don’t consider the ROPO effect in your sales, marketing, advertising, and pricing strategies, you aren’t really considering your entire assortment. Say your online marketing team wants to boost online sales. If they don’t consider the ROPO effect, they’ll probably discontinue advertising on all products that don’t result in a high volume of sales online. When you consider the ROPO effect though, you might notice that certain products — like running shoe — might perform poorly online, but drive a high number of in-store visits. Let’s imagine a more concrete example. 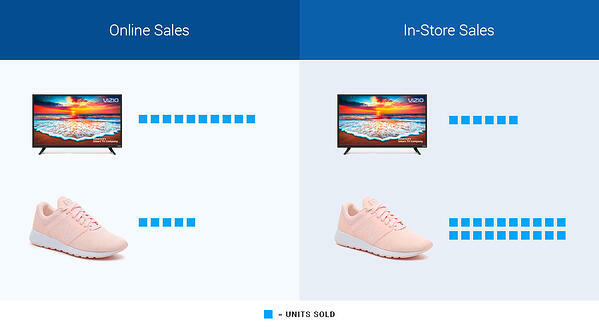 Take a look at the graphic below, showing the number of online and in-store sales for a television and a pair of running shoes. 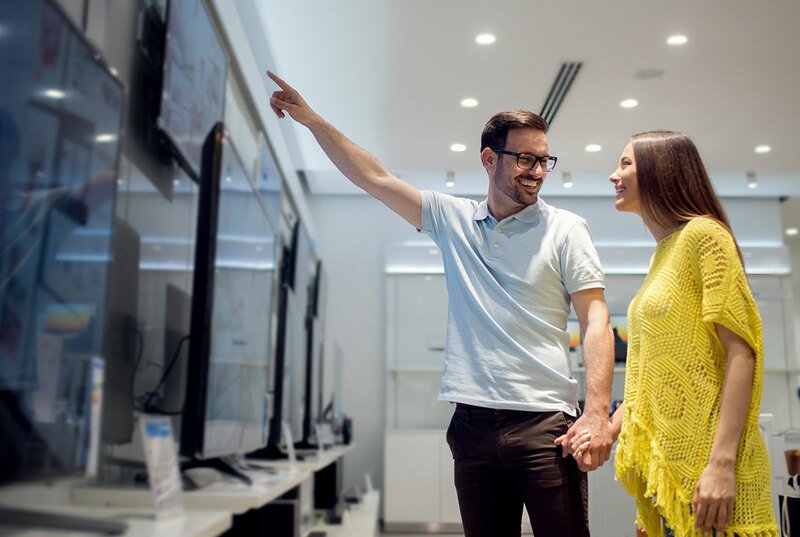 You can see that the television is making multiple sales online, but is under-performing in-store. But you can also see that the shoes perform poorly online but sell like crazy in-store. If you were a marketer and you only looked at a product’s online performance, you’d probably redirect your Adspend toward the television. But if you look at your online and in-store sales holistically, you’d see that the shoes drive more overall sales. In this situation, consumers might know exactly which shoes they want to buy, search for the pair on a comparison shopping engine, then go to the nearest store that says they carry these shoes. So while the online sales are low, the advertisement drives people to the store to make their purchase. And there’s an additional benefit to this scenario: once someone enters your store, the chance for cross- and up-sells increases significantly. If this were the case, you’d probably want to continue advertising on this product, even if the online sales were low. Adjusting your strategy for the ROPO effect opens up a new world of possibilities because it allows you to see your entire assortment as one interconnected channel. Your online store becomes an extension of your offline store and vice versa. And optimizing for ROPO can have an enormous impact on your overall sales. How enormous? Well, Decathlon NL used Omnia’s software to optimize for ROPO and saw a 90% increase on in-store sales. In other words, by adjusting for ROPO, they made roughly one sale in store for every purchase online. What's the secret behind the ROPO effect? And how can you use technology to get more traffic and better, more profitable sales? Download your free copy of Why Pricing and Marketing Go Hand-in-Hand to learn more. Which categories are influenced by the ROPO effect? When it comes to ROPO, not all categories (or products) are equally influenced. In general, high-ROPO categories will contain products with a certain “feel” quality. Here’s a collection of high-ROPO categories, though this list is by no means exhaustive. Fashion is a category that’s extremely susceptible to the ROPO effect. That’s because unless you know your exact size and fit, most people want to try on clothes before they buy. Even though online fashion retail is booming, physical stores will still always be high-traffic areas for a few reasons. One is because consumers want to see (and feel) their clothes before they buy them. Consumers also want to avoid the hassle of returning clothes through the mail system. Beauty is another interesting retail space that has a high ROPO effect. Similar to fashion, there are wide swaths of consumers who simply enjoy going into a store and buying their beauty products. This is category also relies heavily on sales consultants and industry experts. Many makeup stores, for example, will have promotions in-store where you can get your makeup done for free by a professional makeup artist. The artist then uses that opportunity to educate consumers on the different products and demonstrate how the product works. As we previously mentioned, sports equipment (and clothing) is heavily influenced by ROPO. Whether it’s running shoes or a new bike, consumers will research before they buy. And if it’s their first time purchasing, chances are they will go to a store to test out the product before purchasing. Household items large and small are responsive to ROPO as well, especially small items like kitchen utensils, light bulbs, batteries, and the like. These are the kind of products that most consumers won't necessarily need (or even use) every day. But when the need arises, it's likely a pressure that needs to be filled immediately. If you decide to make a soup, for example, but realize you don’t have a ladle, you might look online at the nearest home goods store to see if there are ladles in stock. For most of us it doesn’t matter if the price is €8 online compared to €10 in-store — if you need it that day, you’ll pay for the convenience of an in-store pickup. The last high-ROPO category we'll cover is furniture and lighting. Whether it’s a couch or a standing lamp for the corner of your bedroom, it’s difficult to evaluate the look and feel of these pieces based on an online photo alone. This is especially true for high-ticket, pre-assembled items that are large and bulky. The cost and hassle of getting these pieces delivered is great enough to drive consumers to a store before they purchase. Think about your customers. What is their journey through your store? Why are they purchasing your products? Your marketing teams will have some great insights into your consumers and be able to help you figure out what categories are susceptible to ROPO. But beyond marketing insights, which will only help you make an educated guess, you can also use hard data to better understand your customers and their buying habits. Here are 5 ways you can extract that data from your daily operations. Here are 5 simple ways to measure the ROPO effect on your products and your store. GPS tracking is the ideal way to measure the ROPO effect. That‘s because it‘s the most accurate way to see how your online advertisements influence physical store foot traffic. With a few Google tools, you can clearly see how many people view an advertisement online, then use GPS data to follow how many people enter your physical store after viewing the ad. “Soft conversions” let you estimate the influence of ROPO on your assortment. Place a button on the product page that allows the visitor to check your brick-and-mortar location and stock levels. If the visitor clicks on it, you can treat this as a “soft conversion,” which helps you know that the visitor is interested in your store. Perform an easy statistical analysis to experiment with the ROPO effect on your in-store sales. Simply take the amount of traffic on a product on your website then match it to the number of sales in-store. If you alter your marketing strategy to double the amount of traffic on a product listing and the number of in-store sales also increases, the ROPO effect might be the reason. Customer information like email addresses is extremely valuable to analyze the ROPO effect. Use this data and online customer profiles to generate insights about earlier steps in the customer journey. You can also link that data to your AdWords and Facebook profiles to connect your sales and advertising clicks. Surveys are an effective (but expensive) way to measure the ROPO effect in real time. Ask customers at a cash register what prompted them to come to the store and buy the product. You need the data from 200-500 customers to generate a proper analysis. After you’ve discovered which products are heavily influenced by the ROPO effect, you need to determine the optimal price for them. Your new price needs to be lower, or in-line with, your biggest competition on the market. The goal is to have these products proudly displayed on comparison shopping engines so customers can see that you carry the product. Even though you offer a discounted price, however, that price should still align with your overall commercial objective. The final step to ROPO optimization is to adjust your Google Shopping bids and Adwords spend to ensure your competitive edge over your competition. The goal is for your product to appear at the top of search results to let interested shoppers know that you carry the product they are looking for. This step requires cooperation and coordination between your pricing and marketing teams. These two teams will need to work in tandem to find the right balance between a low price and high marketing spend. They will also need to monitor these products to make sure they are always competitive. If a competitor decides to drop their price, for example, you will need to adjust yours to match the market. If you want to optimize for ROPO — and other omnichannel strategies — the easiest way is with a software. Products like Omnia can track your products for you and help you determine which are most susceptible to the ROPO effect. But what’s even more helpful is that Omnia can then automatically adjust your prices and marketing bids with the market so you always stay competitive. So, instead of asking one person from the marketing team and one person of the pricing team to constantly watch your products and update bids and prices, you can just let the software take over this tedious part of the manual labor. Curious how Omnia can help you harness the ROPO effect and drive more sales? Get in touch today and chat with one of our consultants about your store. Click the button below to get started.